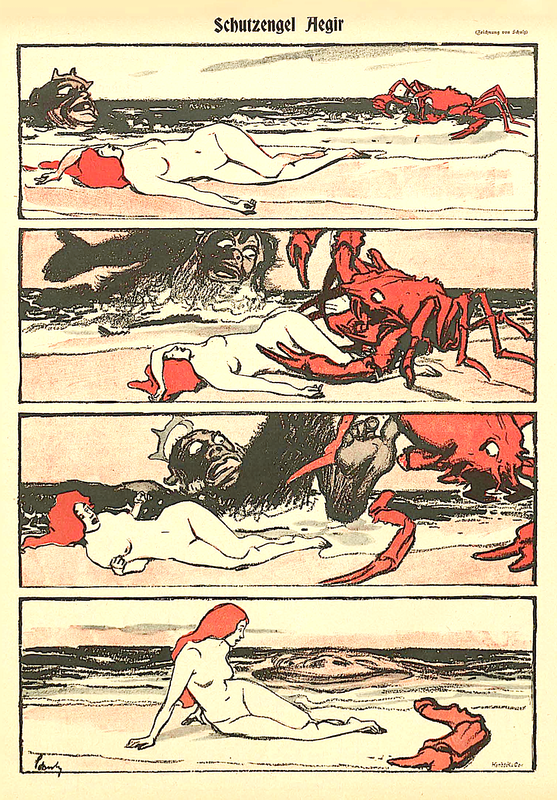 ARTIST Wilhelm Schulz (1865-1952), of Lüneburg, Germany, was a contributor to Simplicissimus almost from the start on April 4, 1896. 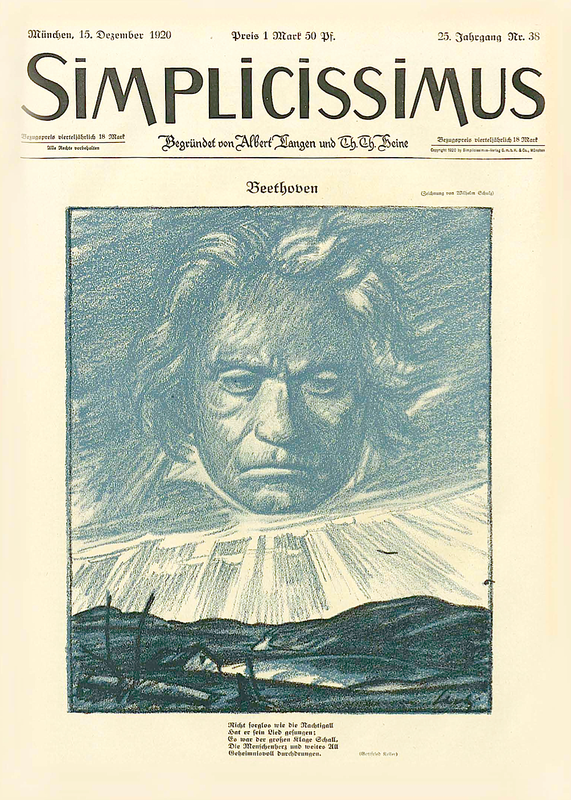 His first of nearly 2500 contributions was in issue number 5 of May 2. 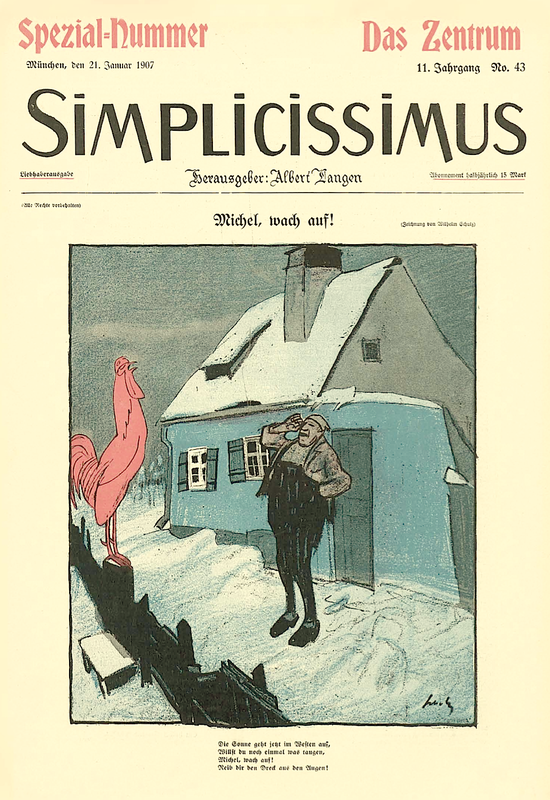 Simplicissimus was a prominent satirical weekly founded in Munich by its publisher Albert Langen (1869-1909) and artist Thomas Theodor Heine (1867-1948). 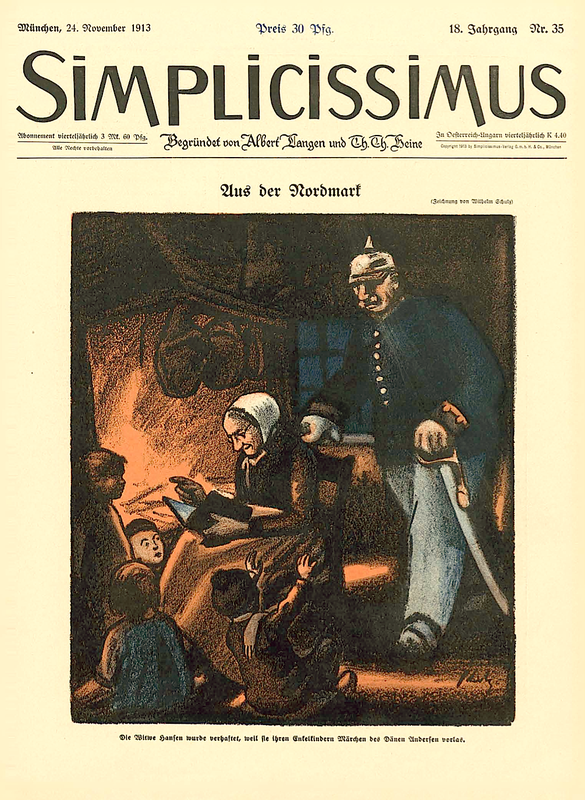 It started only months after a similar German paper was launched in January with the title Jugend that sparked the name Jugendstil (from Jugend: youth + Stil: style); a paper published by Georg Hirth (1841-1916) and first introduced as ‘Münchner illustrierte Wochenschrift für Kunst und Leben’ (Munich illustrated weekly for Art and Life). 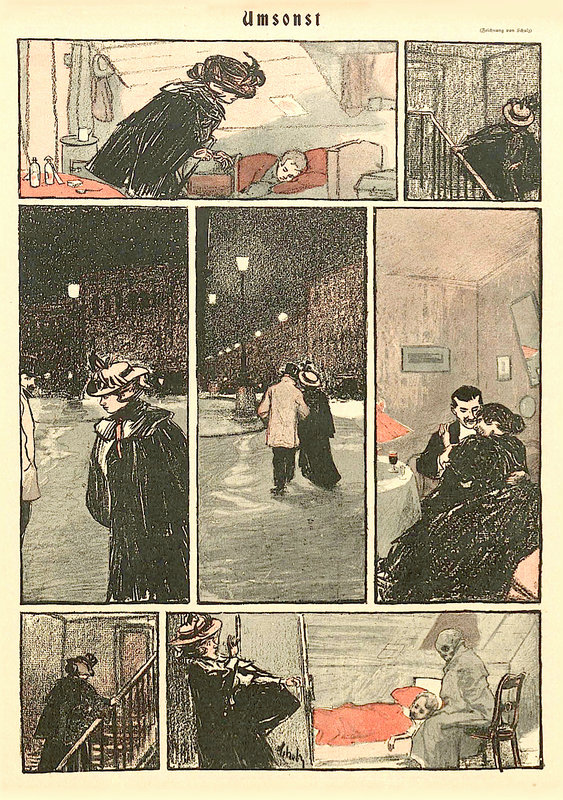 A vital ingredient in both Jugend and Simplicissimus was exciting graphic art, including comics art. 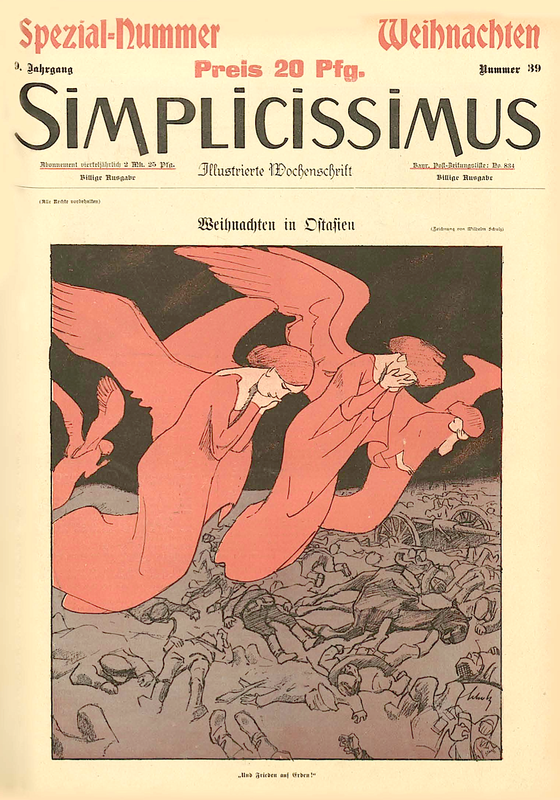 7 [1913, Nov 24] From the north country (Aus der Nordmark), Wilhelm Schulz cover of Simplicissimus 35, Vol. 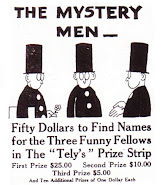 18, p.569. 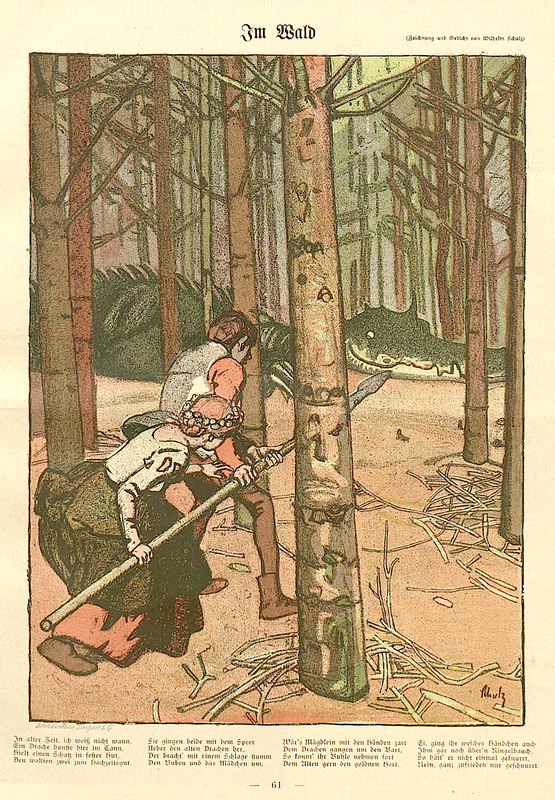 On the fairy tales of Hans Christian Andersen. 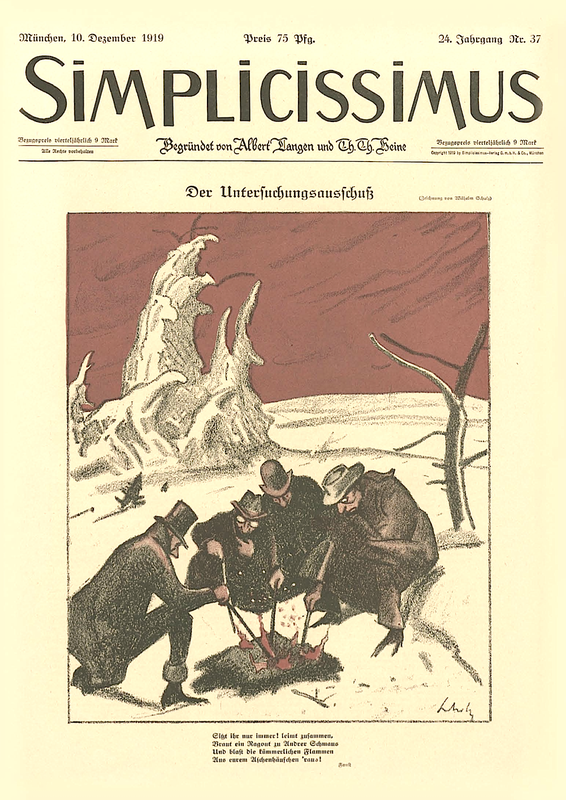 8 [1917, Jan 2] Panic in the munition trade (Panik im Munitionsgeschäft), Wilhelm Schulz, full page of Simplicissimus 40, Vol. 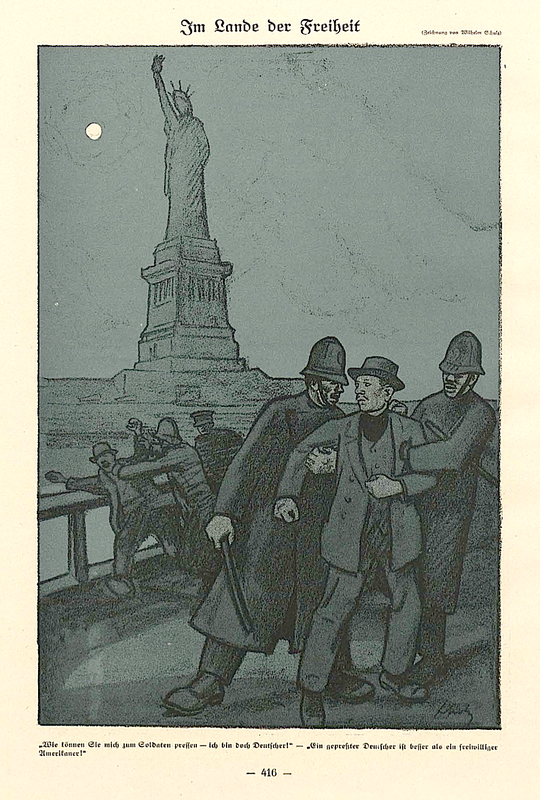 21, p.508. 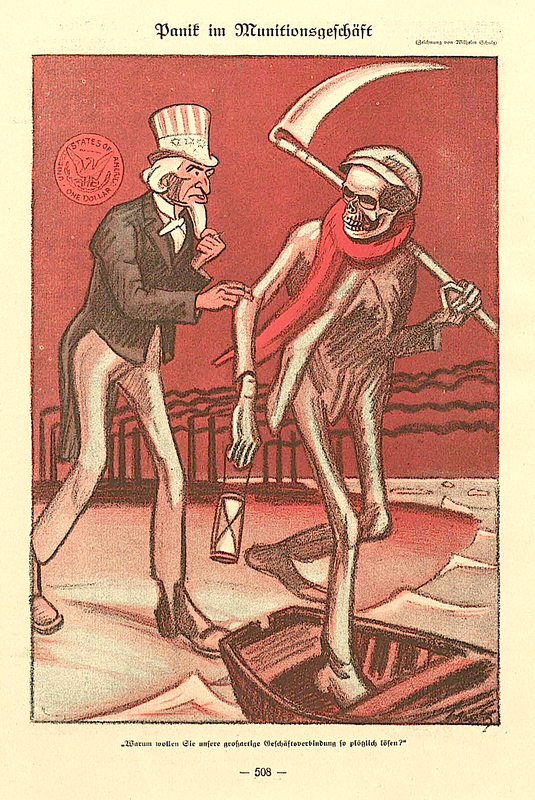 Uncle Sam deals with Death. 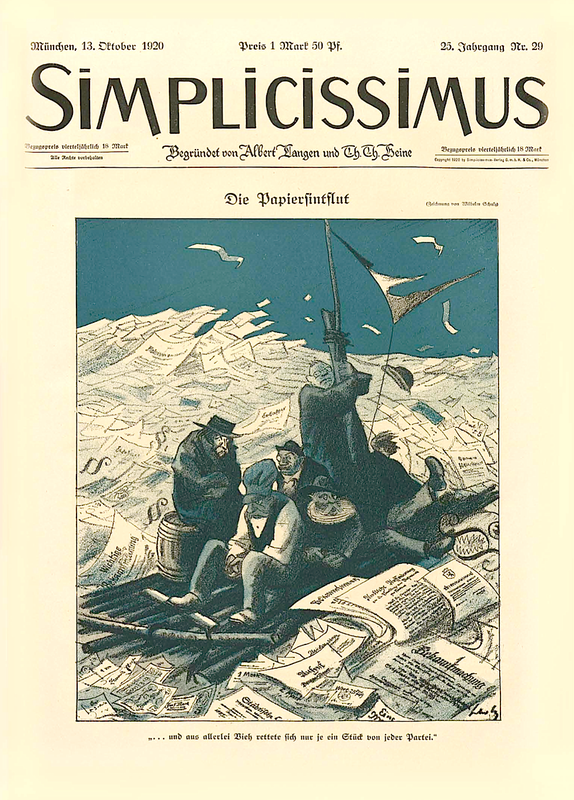 The first Simplicissimus ran from April 1896 to September 1944. 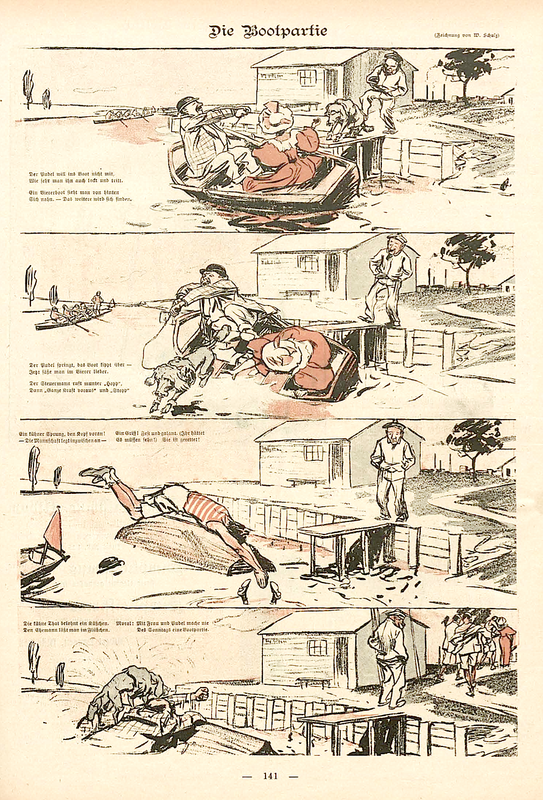 It was revived under the abbreviated title Der Simpl in 1946-50 (subtitle: ‘Kunst - Karikatur - Kritik’), and then as Simplicissimus again, by illustrator Olaf Iverson, in a final series that lasted from 1954 until 1967. 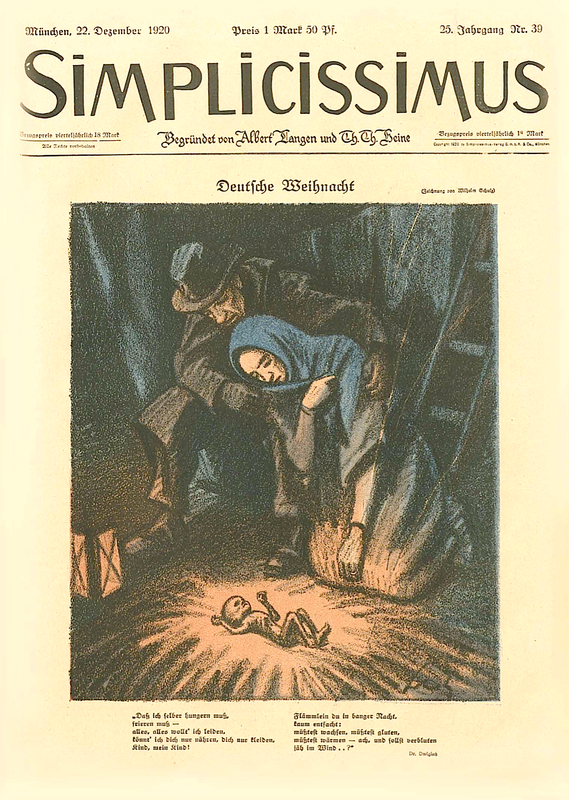 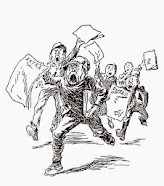 Jugend ran from 1896 to 1940.